Stephen King is a staggeringly prolific author who has, deservedly, amassed a large, devoted following of readers over the course of his career. His reputation as a master of the macabre is well earned, and his work is beloved for a reason; he tells stories that can be frightening, unsettling, and often sickeningly gruesome, but they are also full of warmth, compassion, and decency. He is a gifted yarn-spinner, who cares as much about the worlds he builds and the people who inhabit them as he does about getting under his readers' skin. It's possible to read King and not be frightened for your life, but you can still feel concern for his characters, because King himself has genuine affection for them. Even the most foolhardy ones are capable of garnering sympathy, and even his most heinous villains are often afforded flashes of humanity, no matter how fleeting. The same locations, often sleepy little towns in Maine, are revisited time and again in King's work, with many of his stories becoming threads in one larger story set in King's own multiverse – a place that is quaint, folksy, and unmistakably American, with all that that descriptor entails. Beneath the Norman Rockwell-esque exteriors, however, there's always something else lurking, which is cruel, dangerous, and relentless. King loves nothing better than to pluck decent folk, often children, out of their ordinary lives and subject them to absolute hell on earth. Novels like IT, The Shining, and Salem's Lot are, at their core, epic adventure stories that deal with the battle between good and evil. Despite the bleak trappings, good often triumphs. Eventually. More or less. But 1983's Pet Sematary is not one of those Stephen King stories. There's talk of the Wendigo, sour ground, and ancient evil, but the real adversary is death itself, which is neither good nor evil, simply inevitable. The motivating force that drives the narrative is parental fear, and the knowledge that it is ultimately impossible to protect your children from death. Because you can't reason with death; you can't bargain with it, outrun it or cheat it. It's universal, the great equalizer. It's OZ: The Great and Terrible, and, no matter how brave or clever or good we are, it's eventually coming for all of us. Nods to Frankenstein and The Wizard of Oz are woven into the fabric of Pet Sematary, but its biggest source of inspiration is W.W. James's 1902 short story "The Monkey's Paw," a supernatural tale about a couple gifted with the titular item, which has the ability to grant them three wishes, but at a terrible price. The expression "monkey's paw" has seeped into our collective consciousness, as a concept that's synonymous with the caveat buyer beware. What are you willing to sacrifice in order to get what you want? And, once you get it, are you gonna be happy with the choice that you've made? You may think you can cheat death, but death is the house. And the house always wins. Pet Sematary is one of Stephen King's more straightforward stories. Compared to IT, a 1000 plus page tome with multiple protagonists, dual timelines, and decades’ worth of town history to cover, Pet Sematary is streamlined and intimate, set almost entirely in one location and focused on one small family and their many misfortunes. Doctor Louis Creed (Jason Clarke) has just relocated from Boston to Ludlow, Maine, where he has accepted a position as director of the local university's medical center. The story opens as Louis and his family – wife Rachel (Amy Seimetz), eight year old daughter Ellie (Jeté Laurence), toddler son Gage (Hugo and Lucas Lavoie) and pet cat Winston "Church for short" Churchill (Leo, Tonic, Jager, and JD) – arrive at their new home, a quaint farmhouse situated on the edge of a seemingly idyllic patch of woodlands. Neither Louis nor Rachel know exactly how far their property line extends, though they are advised almost immediately to stay outta the woods by new neighbor and local harbinger Jud Crandall (John Lithgow), a widower who has lived in the area all his life. Jud also warns the Creeds to be wary of the highway that runs just past their front yard, as it is frequented by delivery trucks making their way to and from nearby factories, often at speeds exceeding the posted limit. If the Creeds need a more tangible warning about the road, they need only wander down the path behind their house. The one that leads to the local Pet Sematary (misspelled on the sign at the entrance because it was created and is maintained by the town's children [editor’s note: much like our site/podcast]), which is full up with many generations' worth of dearly departed companion animals. When Church inevitably strays out of the yard and loses all nine of his lives in the road, Jud offers to help Louis bury him before Ellie finds out about her beloved pet's demise. But Jud catches Louis off guard when he invites him to venture deeper into the woods, beyond the boundaries of the Pet Sematary, to perform the feline's last rights. Turns out there's another burial ground, long abandoned because the soil there "belongs to something else." Something that can resurrect the dead, though Jud warns that they don't come back quite the same. When tragedy strikes the Creed family a second time (because nobody can seem to stay outta the road) Louis has to choose: Can he bear the weight of this crushing loss, or will he try to reverse it? In King's novel, and Mary Lambert's 1989 film, Louis Creed's refusal to accept the inevitability of death brings about his downfall, and destroys the lives of everyone he holds dear. Pet Sematary is a grim, bleak, hopeless tale, but it's also darkly funny. Louis's pain is real, and very relatable, and it's easy to make the argument that his foolhardy decisions are a side effect of his overwhelming grief. He's not in his right mind, and how could anyone expect him to be? And of course there's the Wendigo, the supernatural scapegoat who lurks in the woods, supposedly driving Louis's actions but staying largely behind-the-scenes. A more interesting interpretation might be that Louis is driven by hubris, the kind that seems to come more readily to some people than others. He's the patriarch, the provider and protector of his family. He's father knows best. And he's a doctor. Things like this might happen to other people, but they don't happen to men like him. Louis can fix this, if everyone will just stand back, stop interfering, and give him a chance. And then another. And maybe another after that. Heartbreaking as it is, there's something more than a little hilarious about a character like that getting his comeuppance. If you've read Pet Sematary, or seen the earlier film adaptation, you know to expect that particular sort of déjà vu – the kind that happens when you watch something that comes from a source you're already familiar with. And if your association with the previous work is mostly positive, you might be inclined to turn an especially critical eye on a new interpretation, sizing it up and comparing it to what came before. Adaptations and remakes are hard, because their creators have to make the case that they can not only tell the story, but that they can tell it as well, if not better, than someone else who's already told it. They can also be a breeding ground for cut corners and half measures. If you assume your audience is already familiar with the story and invested in the characters, maybe you don't try as hard to engage them, draw them in, or make them care, because someone else has already done that work for you. There's something off about this new Pet Sematary from the start. The characters are introduced in the same way as they are in the novel and the earlier film. The story initially unfolds in much the same way, too, with one or two very minor adjustments. It's not a shot for shot remake like Van Sant's Psycho, but it doesn't stray far from the source, either. Everything feels muffled, and slightly aloof. It's as if the movie is holding the audience at arms length, keeping its distance, not fully allowing viewers into this world or into the lives of the people who inhabit it. The dialogue feels stilted and clunky, as if it's been selected by algorithm and inserted into the script via some random scary story generator. There's no weight or intention behind any of it. Half-developed ideas, notions, and concepts are clumsily introduced, then quickly evaporate into nothing, and sentences have a way of just trailing off into the perpetual mist that shrouds the accursed woods surrounding the Creed family's home. Sometimes conversations between characters are excised altogether so that information can be more swiftly relayed to viewers by that far more desirable delivery device: the internet-search-for-old-newspaper-clippings montage. Your protagonist may have an amiable old-timer living a stone's throw away, a veritable fount of information about the area and its rich, troubled history but, no, by all means, let Louis Google his home address and see what comes up instead. That's far more compelling to watch. And when the big tragic moments happen, they are presented in such a confounding and detached way that they barely register at all. Watching one of the central characters in your story get mowed down in the road by a negligent trucker, while their family implodes in the immediate aftermath, should be gut-wrenching, but the scene unfolds in slow motion, the musical score replacing the dialogue track. Again the film throws up walls to keep the audience away when it should be inviting them in. We see the anguished cries of the onlookers, but we don't hear them. The rushed funeral sequence that follows plays out in the same way. And all of it has about as much emotional resonance as a life insurance commercial. This is a cinematic adaptation that banks on the name recognition of its creator, knowing that audiences will always come out for the latest flick from "Master of Horror, Stephen King." It exploits the faith and goodwill of King's admirers, doling out a smattering of stale, familiar crumbs over the course of the story – but only ever offering the bare minimum in terms of fan service (or any other sort of service). This movie is your very own monkey's paw, giving you everything you thought you wanted, but in the most unsatisfying way imaginable. Was this movie made by aliens? Robots? People who've never seen a moving picture and have no concept of what actually makes them work? It's not scary, and it's not emotionally engaging. It feels perfunctory, anemic and soulless. "They don't come back the same," you say? No, they certainly do not. Stephen King's writing has spawned countless adaptations and, by and large, he's been pleased with the way other artists have interpreted his work. He has always been critical of Kubrick's take on The Shining, though, describing the movie as "A big, beautiful Cadillac with no engine inside it." By that rationale, Kölsch and Widmyer's Pet Sematary must look like a handful of perfectly serviceable car parts, cobbled together into a shape remotely resembling a Cadillac. There's no engine, but there's no shiny exterior, either. It may look like it can get you where you need to go, but it lacks some of the fundamental components necessary to actually get the job done. 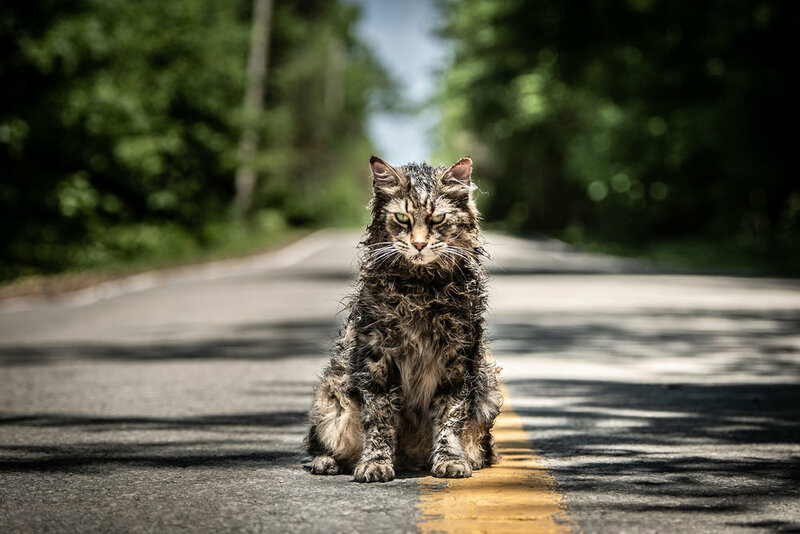 If you've seen the trailers for Pet Sematary, it's not an exaggeration to say you've essentially seen the movie, because the trailers give away all but the last few moments of the story. It's those final moments, though, where this new version radically breaks with tradition, goes rogue, and tosses out King's original conclusion, which completely undermines any kind of message or point that the original story was trying to make. It wasn't until the closing credits started to roll that I fully understood what I'd been watching. This new Pet Sematary is a one hundred and one minute long joke that I didn't realize was meant to be funny until I heard the punch line. And then I felt like a chump for having wasted my time with it. It sacrifices character, story, and consequences so that it can pull one over on the audience with its big dumb "Gotcha!" ending. There are movies that let you in on the joke and allow you to laugh with them, and there are those that deliberately keep you in the dark so they can secretly laugh at you the whole time. This movie feels like the latter. I'd call it anarchic, but that makes it sound more compelling than it actually is. It's spiteful, lazy, and cynical. And the joke's on us. I can't, however, fault the actors, because every single one of them is great (especially Jeté Laurence, who does the bulk of the heavy lifting and makes the movie close to engaging at times), and the performances are uniformly subtle, nuanced, and appealing. And Church, who's played by four separate feline actors, is truly a magnificent beast to behold. This commendable cast deserves better. Stephen King and his fans deserve better. Moviegoers, especially those who love horror, deserve so much better than this.